The etiology for acute seizure in infants and children could be diverse ranging from infective (neurocysticercosis, tuberculoma, meningoencephalitis, and brain abscess), traumatic (intracranial bleed due to recent or past head trauma), vascular (hemorrhage, infarct), metabolic (hypoglycemia, dyselectrolytemia, hypoxic ischemic, and inborn errors of metabolism), structural cause (congenital malformation) or toxic (drug or toxin induced) causes. 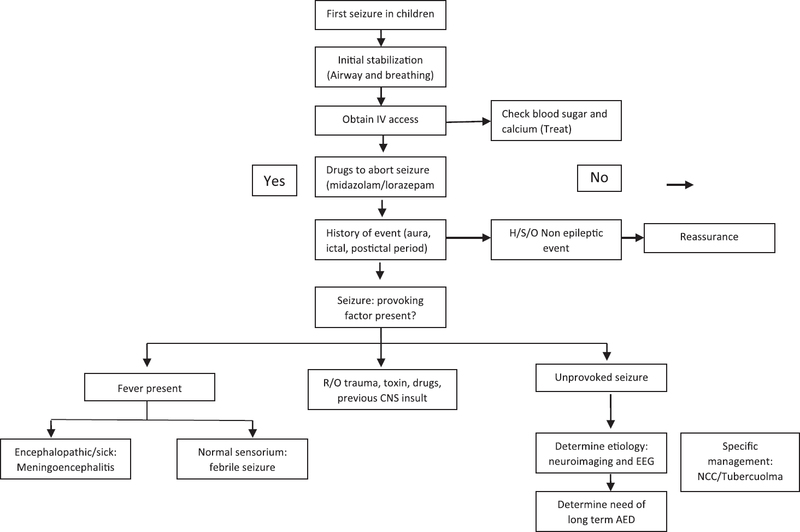 The present review focuses on practical approach to acute first seizure in children in terms of initial stabilization, detailed history, focused examination, and sensible choice of investigation and management plan [Figure 1]. Vital signs including pulse rate, respiratory rate, blood pressure, and oxygen saturation need to be monitored. Indications for endotracheal intubation includes those with persistent desaturation (SPo2 <92%), increased work of breathing, refractory status epilepticus or presence of clinical features of raised intracranial pressure. A peripheral venous access is required to draw the samples for electrolytes, blood sugar, and serum calcium. Circulation needs to be maintained with fluid resuscitation and need of inotropes may be decided based on reassessment so as to stabilize circulating volume to maintain cerebral perfusion pressure. Management of hypoglycemia (5 mL/kg of 10% dextrose) and hypocalcemia (2 mL/kg of calcium gluconate) is essential in all children presenting with acute seizure. Once the child is stabilized, the first step is ascertain the most probable etiology of acute seizure in the child. History is the most essential key to diagnosis of seizure. Parents may be asked to narrate the entire episode including the preceding events, events during the episode, and post episode. [Table 1] summarizes brief history that needs to be elicited. In children, it is essential to differentiate a provoked seizure from unprovoked seizure. Unprovoked seizure would be considered when the seizure cannot be explained by an immediate, obvious provoking cause such as head trauma or intracranial infection. Definition of "unprovoked seizure" would be a seizure or a cluster of seizures occurring within 24 h in a person older than 1 month, occurring in the absence of precipitating factors. The provoking factors include fever, head trauma, previous central nervous system (CNS) infection or tumor, hypoglycemia, electrolyte imbalance (hyponatremia, hypernatremia, hypocalcemia), or history of toxic or drug ingestion. Seizure episodes could be provoked by prolonged fasting (hypoglycemic seizure) or following a diarrheal illness (dyselectrolytemia). Episodes provoked by fever could be either due to febrile seizures or CNS infection (meningitis). Presence of fever (temperature >38°C), generalized seizures, seizure duration of less than 15 min with no postictal loss of consciousness are more likely to be febrile seizures. Children with history of fever, seizure, and encephalopathy are likely to have meningoencephalitis. 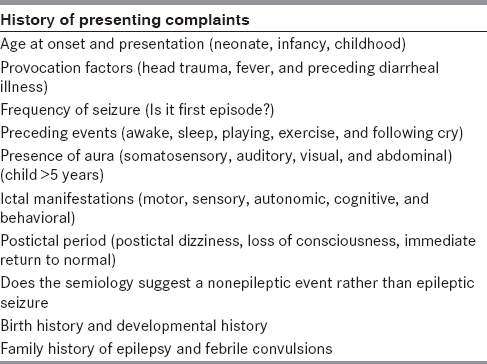 History of developmental delay, perinatal asphyxia or other perinatal or postnatal injury, and positive family history of epilepsy or febrile convulsion points towards an unprovoked epileptic seizures. The description of what the child was doing prior to the event gives a lot of hint toward the diagnosis of seizure. Paroxysmal episode that occurs following an exercise (prolonged QT syndrome or cardiogenic syncope), crying (breath holding spells), or trivial head trauma (reflex anoxic seizure) are more likely to nonepileptic. It is essential to know whether these clinical events occur during sleep (nocturnal epilepsy or parasomnias) or wakeful state. Paroxysmal events that occur following psychological stressor (school maladjustment, peer bullying, parental quarrels, and separation anxiety) could hint toward psychogenic paroxysmal nonepileptic events. The presence of provoking factors such as prolonged standing, crowded place, lack of food, unpleasant circumstances could point to syncope. History of drug ingestion (metoclopramide or prochlorperazine) prior to the episode could point to possibility of dystonic reaction (oculogyric crises). The common seizure mimickers are classified based on type of presentation [Table 2] and age at presentation [Table 3]. Many of the nonepileptic events are benign and are related to normal stages of development. The most common benign developmental movement disorder in infants and toddlers include breath holding spells. These episodes starts with provoking factors such as angry, fussy and crying baby who suddenly becomes apneic, gets cyanosed, lose consciousness and may have urinary incontinence and become stiff. This sequence of crying followed by apnea, cyanosis, loss of consciousness, and tonic posturing is classical with breath holding spells. 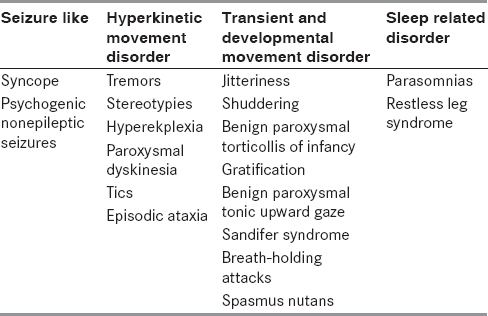 Other benign nonepileptic events on infants are summarized in [Table 4]. Most of these benign movement disorders occur in typically developing infants and toddlers with normal electroencephalogram (EEG) study. Most common nonepileptic events in older children and adolescents that mimic seizure include syncope, pseudoseizures and parasomnias. Syncope is characterized by precipitating factor (such as crowded place and prolonged standing), presence of prodromal symptoms (tinnitus, dizziness), gradual onset, associated pallor, and sweating that occurs for a brief duration (<30 s) with rapid recovery and no postictal confusion. It is important to understand that tongue bite, urinary incontinence, and convulsive seizures can occur rarely in syncope. Once the possibility of nonepileptic event is ruled based on clinical history, detailed description of the clinical seizure is of paramount importance. Auras can occur at the beginning of seizure that lasts for seconds to minutes and defined by subjective symptoms such as somatosensory, visual, auditory, olfactory, gustatory, autonomic, abdominal, and psychic phenomena. It is essential to delineate the seizure semiology and its classification for correct diagnosis, treatment, and prognosis. Moreover, the type of seizure determines the choice of antiepileptic drug (AED) and need for surgical interventions. Description of the event should be elicited from the person who witnessed the event rather than hearing it as a second-hand information. The information would become more meaningful if parents were able to capture the event as video. The description must include presence or absence of motor, sensory, autonomic, cognitive, behavioral and psychic symptoms along with the description of postictal phase. How to Classify the Seizure? Rapid assessment of airway, breathing, and circulation are the first priority in examination. Presence of altered sensorium in a child with acute seizure could indicate evidence of encephalopathy. 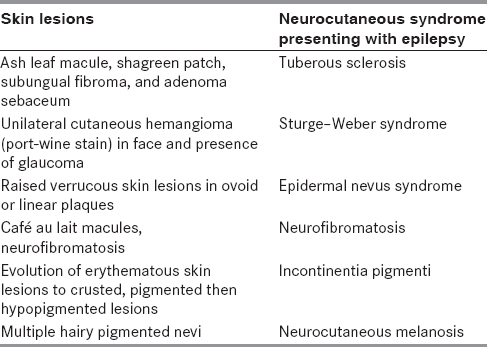 General physical examination must focus to look for any evidence of neurocutaneous stigmata [Table 5]. Similarly presence of injury marks on forehead could indicate drop attacks or myoclonic jerks. Higher mental function must focus on cognition, learning, behavior, communication, social interaction, sleep, and memory. Pupillary size and reaction could hint toward presence of toxidrome (organophosphorus and opioid poisoning). Fundus examination must be done to rule out intraocular cysticercus and any evidence of papilledema. Presence of focal neurological deficit such as facial nerve palsy, hemiparesis point to cerebrovascular cause. Similarly, features of raised intracranial pressure (bradycardia, hypertension, irregular breathing, hypertonia, hyperreflexia, fundus showing papilledema) must be looked. Presence of meningeal sign could indicate meningitis or subarachnoid bleeding. Choice of investigation will depend upon differential diagnosis generated based on the history and examination. All children who present to the pediatric casualty department with a history of acute seizure must be subjected to tests of blood glucose level, serum electrolytes, and blood calcium. In febrile children with acute seizure, complete blood counts and serum C reactive proteins may be estimated. In children with suspected toxic or drug-induced etiology, blood levels of suspected drug must be ordered. Any child with meningeal signs is an indication of lumbar puncture. In children who present with fever and seizure, indications of lumbar puncture include those with meningeal signs or where the history and examination suggests an intracranial infection. Lumbar puncture is optional among children aged 6-12 months who are unimmunized or have undergone incomplete immunization with hemophilus influenzae type b (Hib) and pneumococcal vaccine and those who were pretreated with antibiotics. Lumbar puncture is warranted once features of raised intracranial pressure have been ruled out both clinically and radiologically [contrast enhanced computed tomography (CECT) brain]. The goals in the management of acute seizure in the pediatric casualty department are initial stabilization, treatment of dyselectrolytemia and hypoglycemia, drugs to abort the ongoing seizure activity, determining the etiology, and deciding on need of long-term anticonvulsants. Correction of primary electrolyte disturbance remains the mainstay of therapy among those with hypoglycemia (5 mL/kg of 10% dextrose), hypocalcemia (2 mL/kg of 10% calcium gluconate), hyponatremia (if serum sodium <120 meq/L, administer 3% NaCl 4-6 mL/kg) or hypernatremia. Drugs that can be used to abort the ongoing seizure in hospital setting include intravenous (IV) lorazepam (0.1 mg/kg), IV diazepam (0.3-0.5 mg/kg), or IV midazolam (0.1-0.2 mg/kg). The drugs that may be used as an abortive measure in an out-of-hospital setting include intranasal midazolam (0.2 mg/kg; 0.5 mg/puff) or per rectal diazepam (0.5 mg/kg). In addition, among those with raised intracranial pressure, measures to decrease the raised intracranial pressure (3% saline or mannitol) must be initiated. Short acting benzodiazepines are often used as acute abortive measures. Among those with epileptic seizures, loading doses of long acting AEDs are required. Children with the presence of global developmental delay, static or progressive brain insult, head trauma, focal seizures, family history of epilepsy are more likely to have epileptic seizures. This obviously excludes provoked causes such as febrile seizure, seizure secondary to dyselectrolytemia that does not require AED loading. What is a right choice of AED? Among children with multiple types of seizures, especially myoclonic and absence seizure, broad spectrum AEDs, such as valproate and levetiracetam, may be preferred. However, in infants with suspected neurometabolic disorders including mitochondrial disorders, valproate may be avoided. The choice of drug will also be determined by the type of seizure: Focal seizures (phenytoin or levetiracetam) and for generalized seizures (phenytoin or valproate) [Table 6]. Long-term AEDs are discouraged for the first episode of unprovoked seizure with normal neuroimaging and EEG findings once parents have been explained about the risk of recurrence of up to 50-60%. Among these children with normal investigations, AEDs are started with second episode of unprovoked epileptic seizure. Long-term AEDs are initiated following the first unprovoked seizure among those with parenchymal structural lesions such as tuberculoma, neurocysticercosis, or infarct. Children with developmental delay, family history of epilepsy, presence of neurocutaneous markers, and congenital brain malformation also require broad spectrum AEDs such as valproate and levetiracetam. Parental counseling sessions must be an essential part of the management of first seizure in children in order to allay parental fears, negative reactions, and apprehensions of stigma or social taboo. The main focus of discussion with parents may include the chances of its recurrence, home management of seizure, need for AEDs, possible adverse effects of AED, duration of AED therapy, role of investigations techniques such as MRI brain and EEG, and based on the etiology explanation of overall outcome of seizure. Domiciliary management of seizure must focus on emphasis of recovery position during active seizure and use of rescue medication such as intranasal midazolam (0.2 mg/kg; maximum: 10 mg) in case of prolonged seizure (>3-5 min). In addition, parents must be counseled to maintain strict compliance with medications, need to administer medications by correct measurement (using syringe for mL) and to report to treating physician in case of any adverse event or seizure recurrence. In this regard, it will be useful to give these instructions as a patient information sheet. Fisher RS, van Emde Boas W, Blume W, Elger C, Genton P, Lee P, et al. Epileptic seizures and epilepsy: Definitions proposed by the international league against epilepsy (ILAE) and the international bureau for epilepsy (IBE). Epilepsia 2005;46:470-2. Panayiotopoulos CP. Epileptic seizures and their classification. In: Panayiotopoulos CP, editor. A Clinical Guide to Epileptic Syndromes and their Treatment. London: Springer-Verlag; 2010. p. 21-63. Sridharan R, Murthy BN. Prevalence and pattern of epilepsy in India. Epilepsia 1999;40:631-6. Goel D, Agarwal A, Dhanai JS, Semval VD, Mehrotra V, Saxena V, et al. Comprehensive rural epilepsy surveillance programme in Uttarakhand state of India. Neurol India 2009;57:355-6. Wallace SJ, Farrell K. Epilepsy in Children. 2 nd ed. London: CRC Press; 2004. p. 535. Tasker RC. Emergency treatment of acute seizures and status epilepticus. Arch Dis Child 1998;79:78-83. Gray JT, Gavin CM. 14 Assessment and management of neurological problems. Emerg Med J 2005;22:440-5. Sasidaran K, Singhi S, Singhi P. Management of acute seizure and status epilepticus in pediatric emergency. Indian J Pediatr 2012;79:510-7. Panayiotopoulos CP. Imitators of epileptic seizures. In: Panayiotopoulos CP, editor. A Clinical Guide to Epileptic Syndromes and their Treatment. London: Springer; 2010. p. 97-134. Fung CW, Wong VC. Paroxysmal non-epileptic movements in childhood. HK J Paediatr (New Series) 2012;17:85-96. Wichaidit BT, Østergaard JR, Rask CU. Diagnostic practice of psychogenic nonepileptic seizures (PNES) in the pediatric setting. Epilepsia 2015;56:58-65. Reilly C, Menlove L, Fenton V, Das KB. Psychogenic nonepileptic seizures in children: A review. Epilepsia 2013;54:1715-24. Dash D, Tripathi M. The extratemporal lobe epilepsies in the epilepsy monitoring unit. Ann Indian Acad Neurol 2014;17(Suppl 1):S50-5. Paolicchi JM. The spectrum of nonepileptic events in children. Epilepsia 2002;43(Suppl 3):60-4. Chapman M, Iddon P, Atkinson K, Brodie C, Mitchell D, Parvin G, et al. The misdiagnosis of epilepsy in people with intellectual disabilities: A systematic review. Seizure 2011;20:101-6. Woodhall D, Jones JL, Cantey PT, Wilkins PP, Montgomery SP. Neglected parasitic infections: What every family physician needs to know. Am Fam Physician 2014;89:803-11. Finkelstein Y, Hutson JR, Freedman SB, Wax P, Brent J; Toxicology Investigators Consortium (ToxIC) Case Registry. Drug-induced seizures in children and adolescents presenting for emergency care: Current and emerging trends. Clin Toxicol (Phila) 2013;51:761-6. Wyllie E, Gupta A, Lachhwani DK. The Treatment of Epilepsy: Principles and Practice. Philadelphia: Lippincott, Williams & Wilkins; 2006. p. 1286. McAbee GN, Wark JE. A practical approach to uncomplicated seizures in children. Am Fam Physician 2000;62:1109-16. Rajshekhar V, Joshi DD, Doanh NQ, van De N, Xiaonong Z. Taenia solium taeniasis/cysticercosis in Asia: Epidemiology, impact and issues. Acta Trop 2003;87:53-60. Pohlmann-Eden B, Beghi E, Camfield C, Camfield P. The first seizure and its management in adults and children. BMJ 2006;332:339-42. Hirtz D, Ashwal S, Berg A, Bettis D, Camfield C, Camfield P, et al. Practice parameter: Evaluating a first nonfebrile seizure in children: Report of the quality standards subcommittee of the American Academy of Neurology, the child neurology society, and the American epilepsy society. Neurology 2000;55:616-23. Shinnar S, Kang H, Berg AT, Goldensohn ES, Hauser WA, Moshé SL. EEG abnormalities in children with a first unprovoked seizure. Epilepsia 1994;35:471-6. Raj D, Gulati S, Lodha R. Status epilepticus. Indian J Pediatr 2011;78:219-26. Pellock JM. Standard approach to antiepileptic drug treatment in the United States. Epilepsia 1994;35(Suppl 4):S11-8. Desai P, Padma MV, Jain S, Maheshwari MC. Knowledge, attitudes and practice of epilepsy: Experience at a comprehensive rural health services project. Seizure 1998;7:133-8. Arthur TM, deGrauw TJ, Johnson CS, Perkins SM, Kalnin A, Austin JK, et al. Seizure recurrence risk following a first seizure in neurologically normal children. Epilepsia 2008;49:1950-4. Caviedes BE, Herranz JL. When and how should the long-term anti-epileptic treatment be stopped. Rev Neurol 1997;25:372-8. Chen HY, Albertson TE, Olson KR. Treatment of drug-induced seizures. Br J Clin Pharmacol 2015. [Epub ahead of print]. Galletti F, Sturniolo MG. Counseling children and parents about epilepsy. Patient Educ Couns 2004;55:422-5.